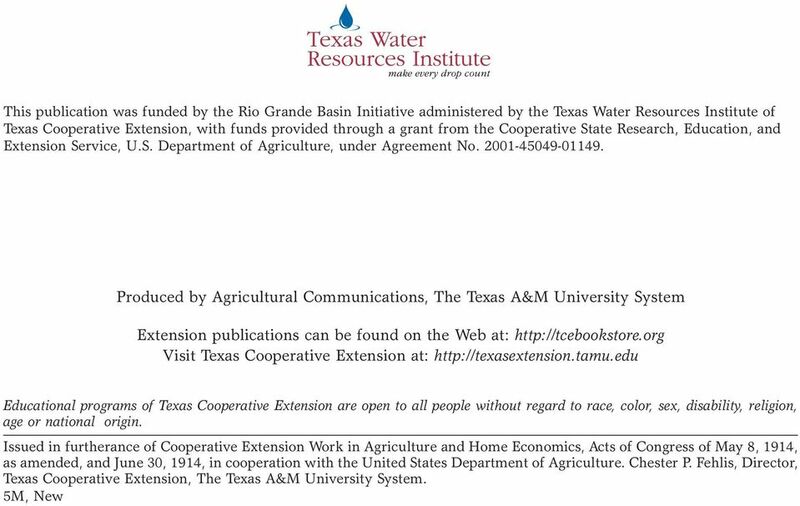 Download "Iron and manganese are two similar elements"
1 L Drinking Water Problems: Iron and Manganese Mark L. McFarland, Associate Professor and Extension Soil Fertility Specialist Monty C. Dozier, Assistant Professor and Extension Water Resources Specialist The Texas A&M University System Iron and manganese are two similar elements that can be a nuisance in a drinking water supply. Iron is more common than manganese, but they often occur together. They are not hazardous to health. What problems do iron and manganese cause? Iron and manganese can give water an unpleasant taste, odor and color. Iron causes reddish-brown stains on laundry, porcelain, dishes, utensils, glassware, sinks, fixtures and concrete. Manganese causes brownish-black stains on the same materials. Detergents do not remove these stains. Chlorine bleach and alkaline builders (such as sodium and carbonate) may even intensify the stains. Iron and manganese deposits build up in pipelines, pressure tanks, water heaters and water softening equipment. These deposits restrict the flow of water and reduce water pressure. More energy is required to pump water through clogged pipes and to heat water if heating rods are coated with mineral deposits. This raises energy and water costs. 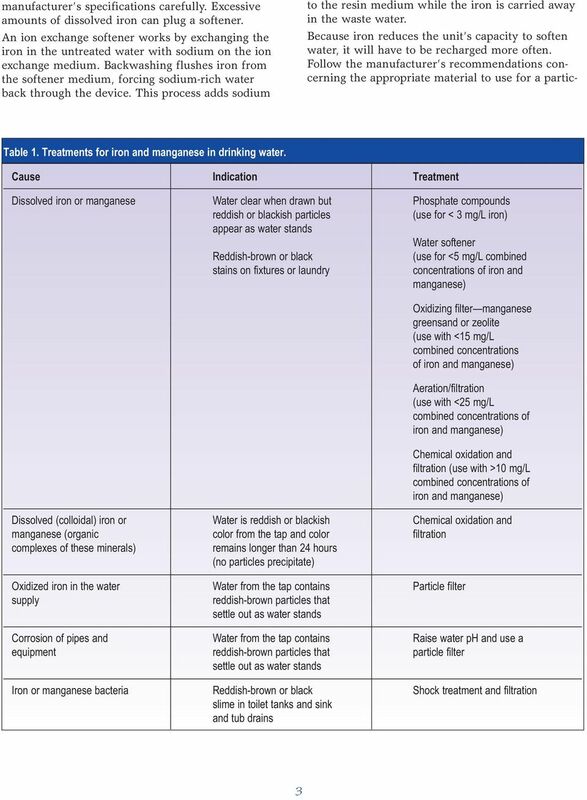 Water contaminated with iron and manganese often contains iron or manganese bacteria. These bacteria feed on the minerals in the water. 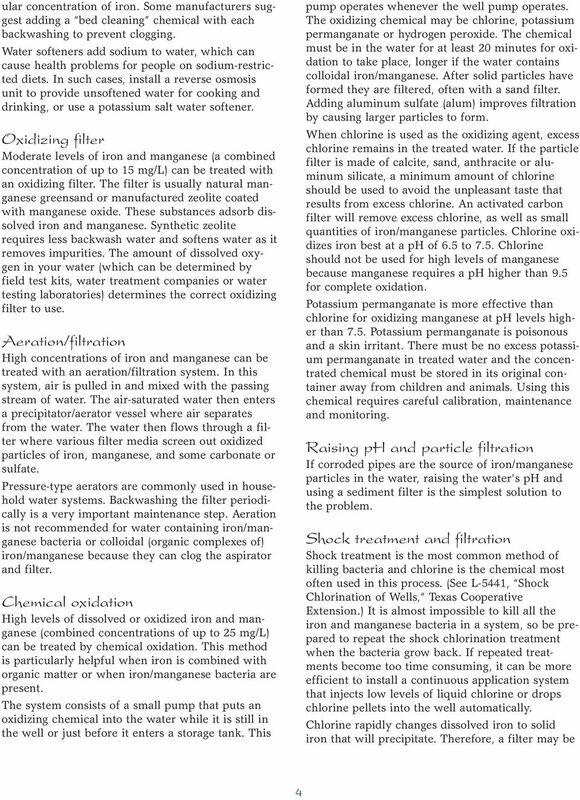 They do not cause health problems, but do form a reddishbrown (iron) or brownish-black (manganese) slime in toilet tanks and can clog water systems. 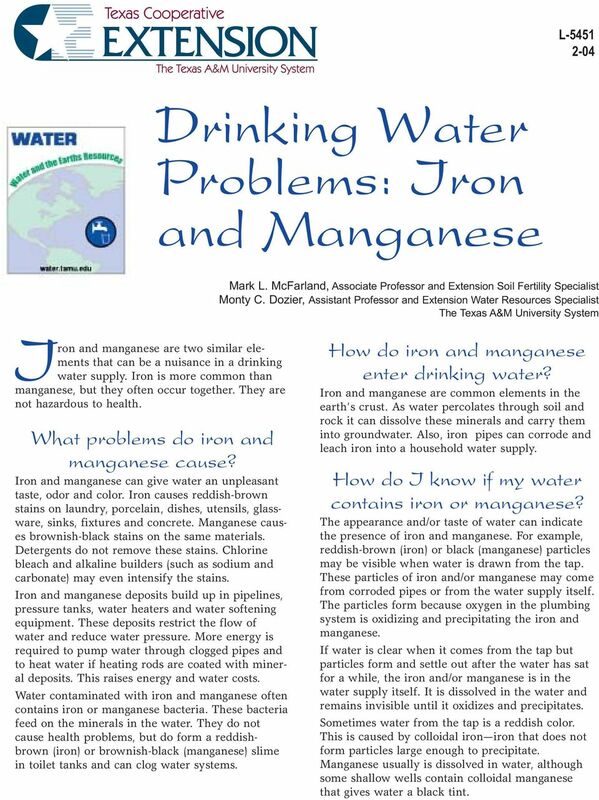 How do iron and manganese enter drinking water? Iron and manganese are common elements in the earth s crust. As water percolates through soil and rock it can dissolve these minerals and carry them into groundwater. Also, iron pipes can corrode and leach iron into a household water supply. 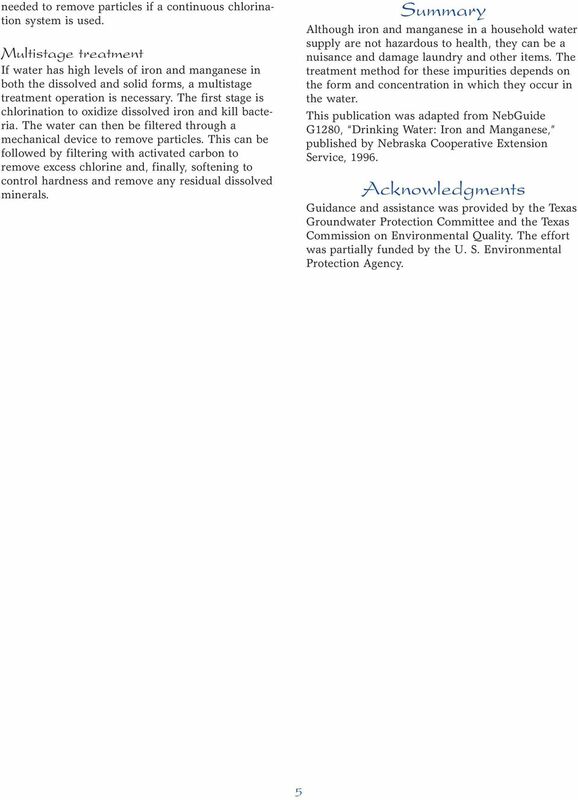 How do I know if my water contains iron or manganese? The appearance and/or taste of water can indicate the presence of iron and manganese. For example, reddish-brown (iron) or black (manganese) particles may be visible when water is drawn from the tap. These particles of iron and/or manganese may come from corroded pipes or from the water supply itself. The particles form because oxygen in the plumbing system is oxidizing and precipitating the iron and manganese. If water is clear when it comes from the tap but particles form and settle out after the water has sat for a while, the iron and/or manganese is in the water supply itself. It is dissolved in the water and remains invisible until it oxidizes and precipitates. Sometimes water from the tap is a reddish color. This is caused by colloidal iron iron that does not form particles large enough to precipitate. Manganese usually is dissolved in water, although some shallow wells contain colloidal manganese that gives water a black tint. 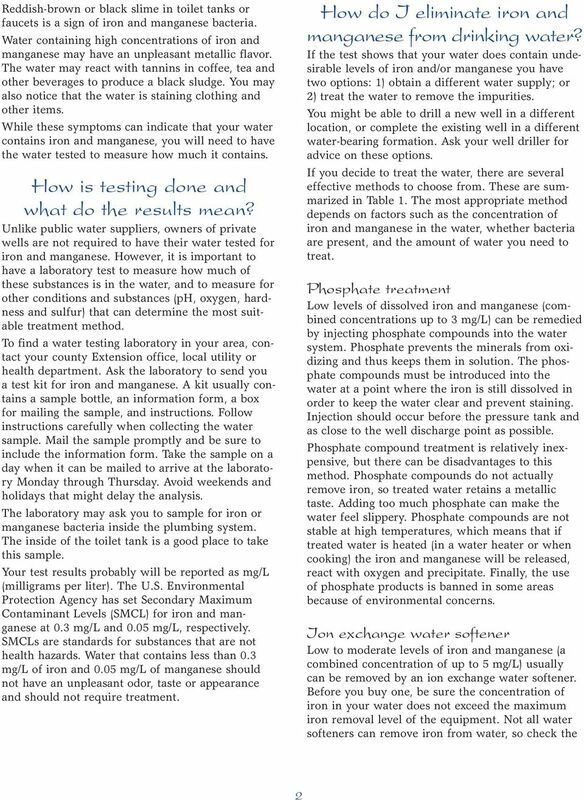 NebGuide Nebraska Extension Research-Based Information That You Can Use G907 Index: Natural Resources, Water Management 1989, 2005, 2009, Revised June 2016 Drinking Water Testing for Quality Sharon O. IMPORTANT: Spa Owner, save this manual. Installer, leave this manual with the spa owner. Owner s Manual EPA Reg. No. 67712-15 EPA Est. No. 091258-MEX-01 IMPORTANT: Spa Owner, save this manual. Installer, leave this manual with the spa owner. Safety Instructions Please read prior to installation.